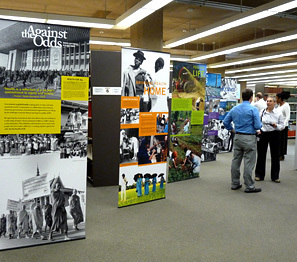 Here are a few Frequently Asked Questions (FAQ) about our Traveling Exhibition Services. If you don’t see your question here, please send us an e-mail at nlmtravelingexhibits@mail.nlm.nih.gov. How do I book a traveling exhibition? If you are interested in booking one of our traveling exhibitions, browse the list of options on the Book A Traveling Exhibition page. Roll your mouse over an exhibition title. Select “Book Now/Tour Itinerary” and review the available dates. Select “Book Now” to let us know your preferred dates for hosting the show. If the dates you selected are still available, you will receive an e-mail that contains a confirmation letter that includes your hosting date as well as other general information. Because our online tour schedule is updated weekly, some dates listed as available may not be so. If the dates you selected are not available, we will send you an email with some alternative dates for hosting the exhibition. How much does it cost to host an exhibition? The National Library of Medicine does not charge a booking fee to borrow a traveling exhibition. The only expense for your institution is the cost for shipping the show, one way. 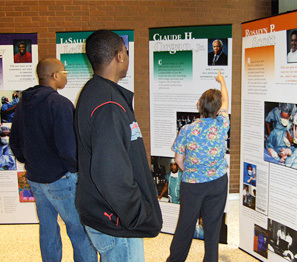 Host institutions ship banner and poster exhibitions using Federal Express three-day Express Saver service for a cost estimated between $300 and $700 for most exhibitions, depending on distance. If your organization does not have a Federal Express account, Jill Newmark must be notified newmarj@mail.nlm.nih.gov. After speaking with Ms. Newmark, you may use UPS or DHL Express as long as you ship the exhibition containers using three-day, two-day or overnight service. Can we charge admission for a traveling exhibition? 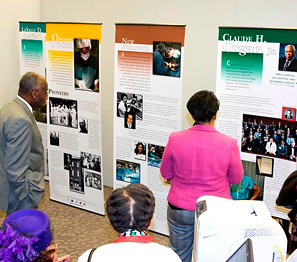 Our traveling exhibitions are part of the outreach and education mission of the National Library of Medicine and must be made available free-of-charge to the public. What happens before I receive the exhibition? About four weeks before your opening date, we will send you an email reminder about your upcoming booking, including contact information for the venue hosting the exhibition before you. That venue’s contact person will get in touch with you to verify your shipping address and confirm the shipping arrangements. How will I know where to send the exhibition after the exhibition closes at my institution? About two weeks before your exhibition closes, the Exhibition Program will send you an email reminder with contact information for the next venue that is scheduled to host the show. You will need to contact that organization to confirm shipping arrangements and the shipping address. How many people does it take to install an exhibition and how long will it take? Assembling the banner exhibition is relatively simple but is best accomplished by two people working as a team. You can plan on spending one to two hours unpacking, assembling, and installing the exhibition at your location. How do I repack the exhibition? The exhibition is repacked into the plastic graphics containers in which the exhibition was received. Each banner structure (rod and foot) is packed in an individual cloth bag. The graphics are each packed in individual round cloth cylinders. These are then placed inside the plastic graphics containers--three cloth bags and three cloth cylinders per graphics container. Will I receive information about the exhibition that I can use for publicity? You will receive images that you can use for outreach and publicity purposes from the Exhibition Program via email approximately four weeks before the opening date of your exhibition. In addition, please check the “More Info” page for your traveling exhibition for additional downloadable materials, including a PR information sheet, and sometimes an exhibition brochure and poster in a pdf format, which you are free to print out and distribute. 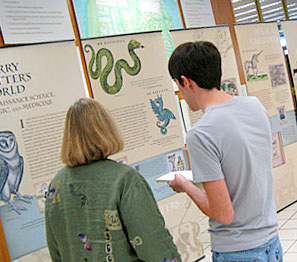 Why do I need to complete a Traveling Exhibition Host Survey? We ask you to complete a Traveling Exhibition Host Survey so we can learn about what went well with your hosting experience and see how we can better serve you. The Survey is a short form that you can complete online.